Northern Pacific Railway constructed a branch line between Cle Elum and Roslyn in 1886 and on to Ronald in 1887 that transported coal as well as local residents. Although the rails are gone, the route has been preserved as a historical walk with markers along the way identifying significant sites. 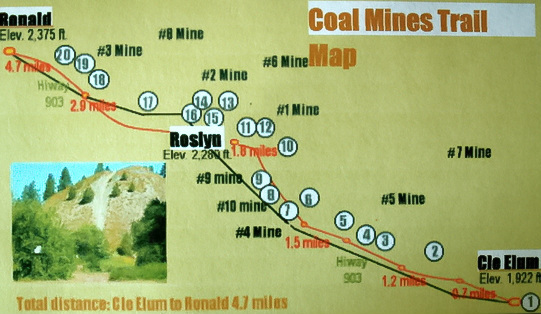 The Coal Mine Trail can be easily accessed from several locations. In Roslyn, park your car at the east end of Pennsylvania Ave. behind Old City Hall near the Slag Pile. This corresponds to #11 on your map. From this point you can either head south towards Cle Elum or follow the trail westerly which takes you along Washington Street just north of Pennsylvania Ave. This passes behind one of Roslyn's most significant landmarks, a block-long brick structure that served as the Company Store - #15 on your map.Continuing westbound on Washington following the railroad ties painted on the street takes you to Runje Field, named after local booster Slim Runje, and a kiosk with a map and more history of the area.